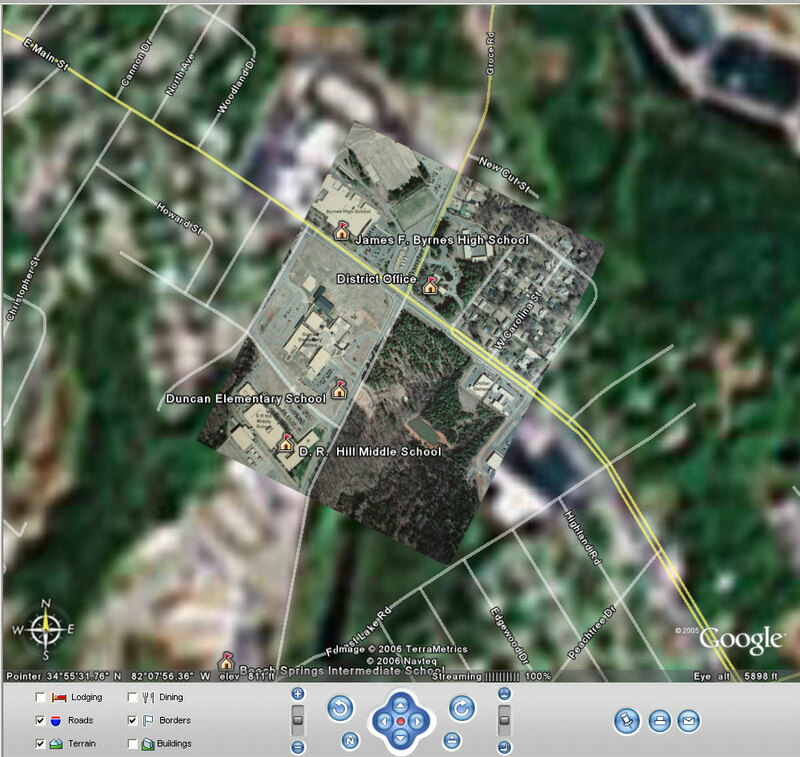 One of the most frustrating things for Google Earth users is that most of the country is in low resolution. This includes the majority of South Carolina, and almost all of Greenville. The folks at GE have built in a temporary workaround by allowing users to add image overlays to GE. However, image overlays can be far more useful than just giving a better image of low-resolution areas. These can be used to interpret and enhance the understanding of a geographic area. This post is not meant to be a tutorial on how to create image overlays, but will give some suggestions on how these might be useful. Let’s first look at the most common usage. This first image from Google Earth the SCALE outdoor classroom in our school district. As you can see it’s in very low resolution, and none of the schools or other features can be made out clearly. This next image has an overlay. 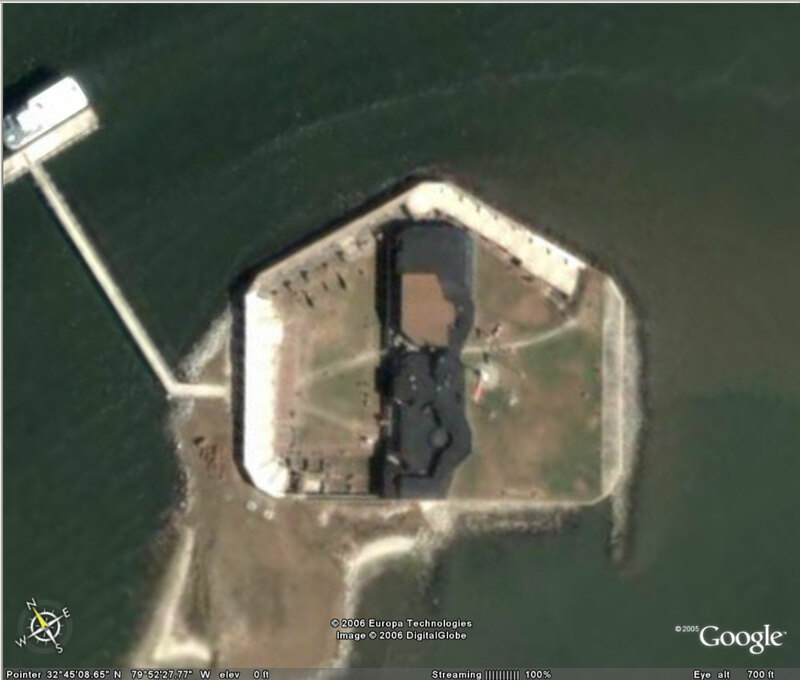 This is an aerial photo that was taken, then placed online so that it could be seen and used by Google Earth. You can see how it brings new life to the blurry GE images. Click on either of these images to view them in their larger format. I’ll use thumbnails from here on out to make the page easier to load. 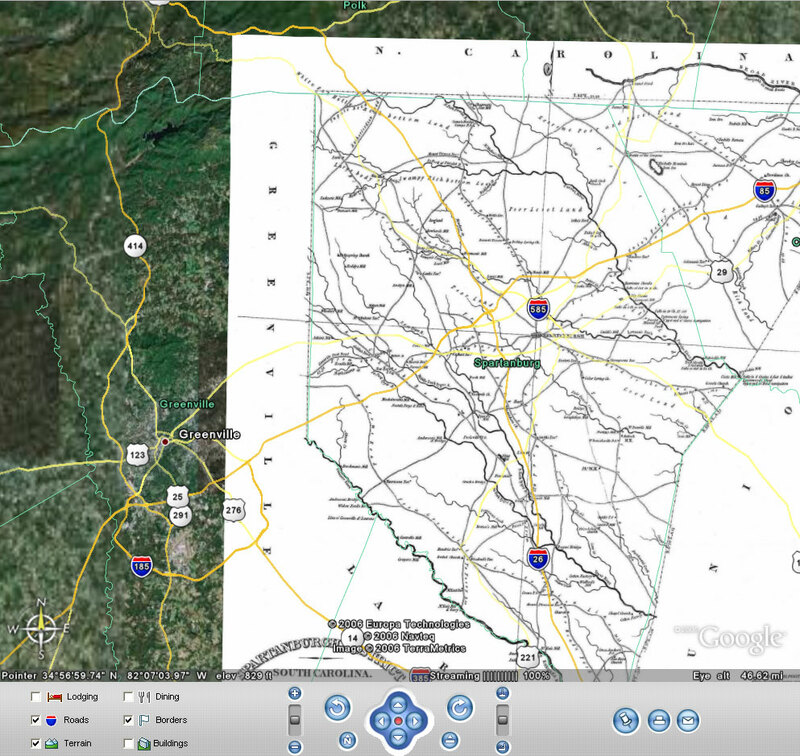 Not only can you add photographic overlays, but you can also use supplemental maps. 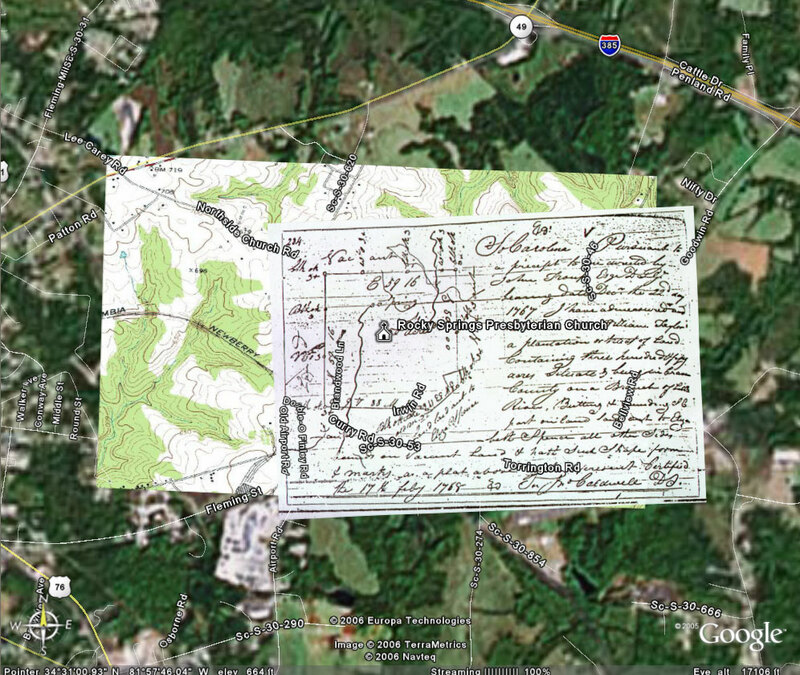 In this next image I found a map of Spartanburg County that was created in 1825. 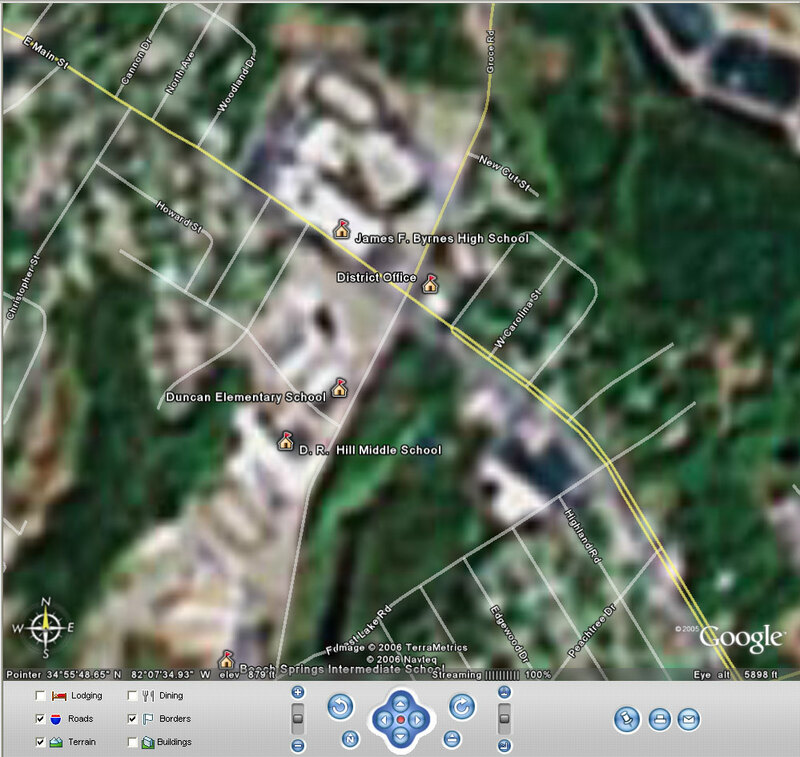 By using this map as an overlay, I can toggle it on and off and compare the accuracy of it wil what is in Google Earth. I can think of tons of uses for classrooms. It was even suggested that this might be a way to look for names for our new schools, by looking for historical geographic names on said map. Historical diagrams can also be used. 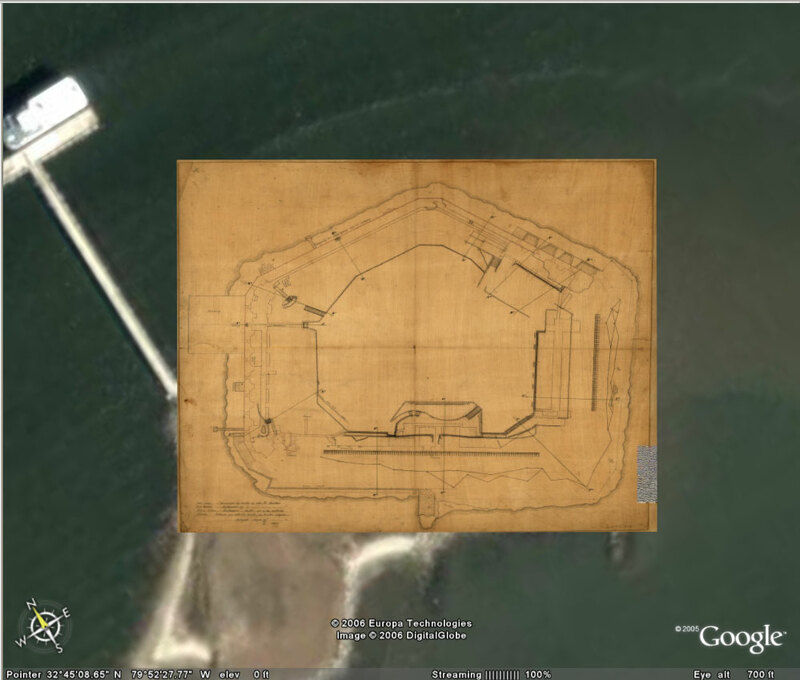 I found a drawing of Fort Sumter on the Library of Congress website. I was able to add it as an image overlay, with a bit of manipulation. The Library of Congress is an excellent resource for historic maps and diagrams through their American Memory Project. The only problem is that the images are in JPEG2 format, which isn’t read by most browsers or imaging software, or they are in MRSid format. This is done because the original files are huge, and these formats allow decompression of just the portion of the file that’s needed. The ER Viewer from ER Mapper is a free utility that will let you view JPEG2 images and convert them to standard JPG files. For local South Carolina resources, Sciway.net and knowitall.org both provide links to historic maps and photographs. There are also several good genealogy sites that have local maps, such as RootsWeb. And finally, speaking of genealogy, I bought my first GPS to use with genealogy research. I wanted to mark the locations of gravesites and homesites as these fell to development and neglect. 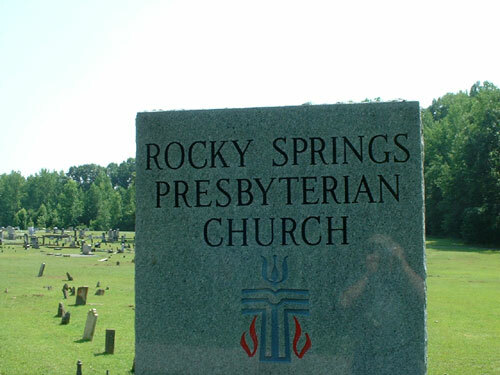 One of our family’s most sacred sites is Rocky Springs Presbyterian Church in Laurens, South Carolina. 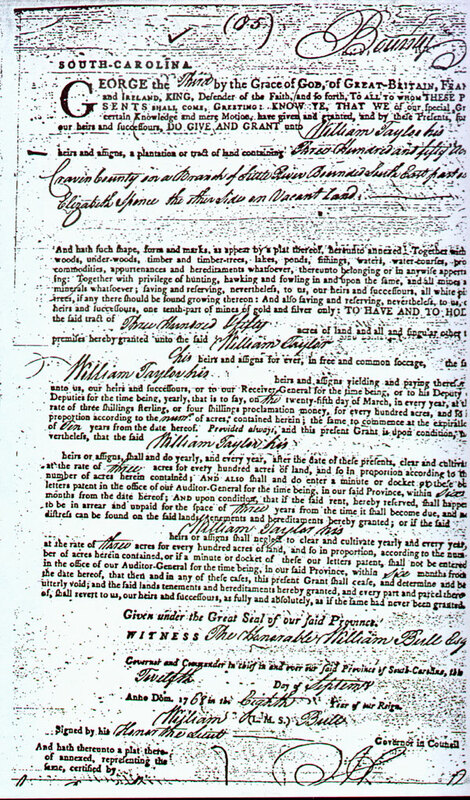 One William Taylor arrived from Ireland in 1767 with a land grant from King George II for 350 acres. He donated about 7 acres for the formation of the church. The church’s cemetery is rife with Taylor headstones. 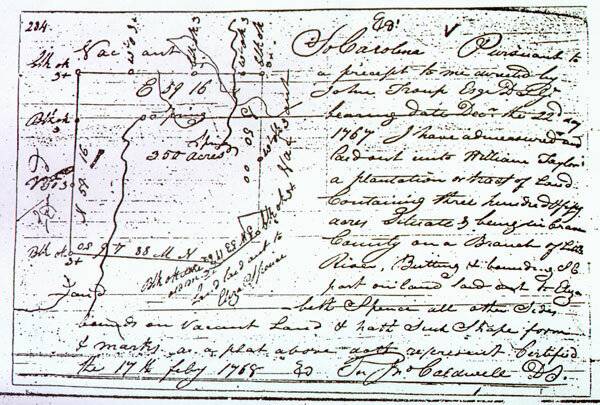 Part of the land grant documents included a rough surveyor’s plat. I wanted to see what area might have been covered by the original grant, so I started looking at the plat as an overlay. 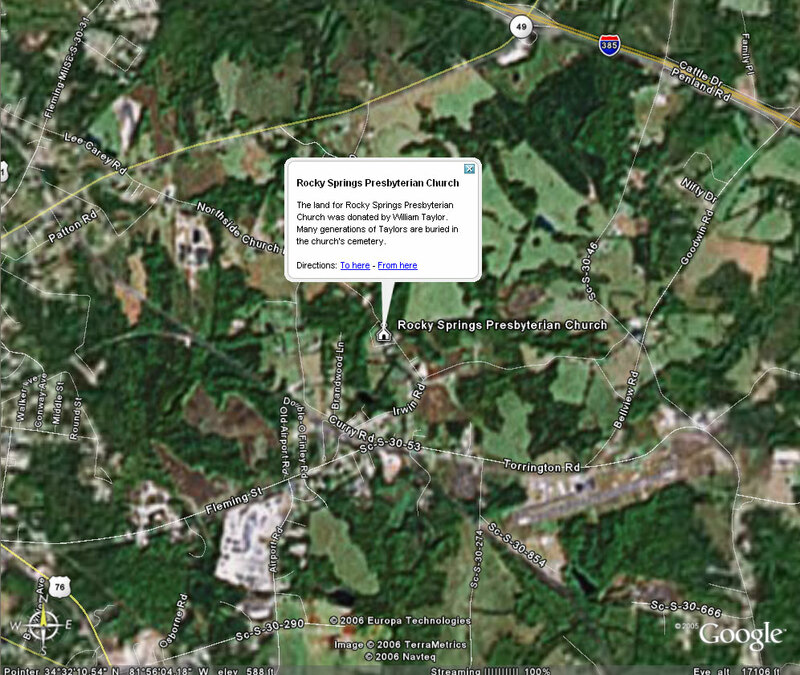 First, I located the church in Google Earth and marked it with a placemark. 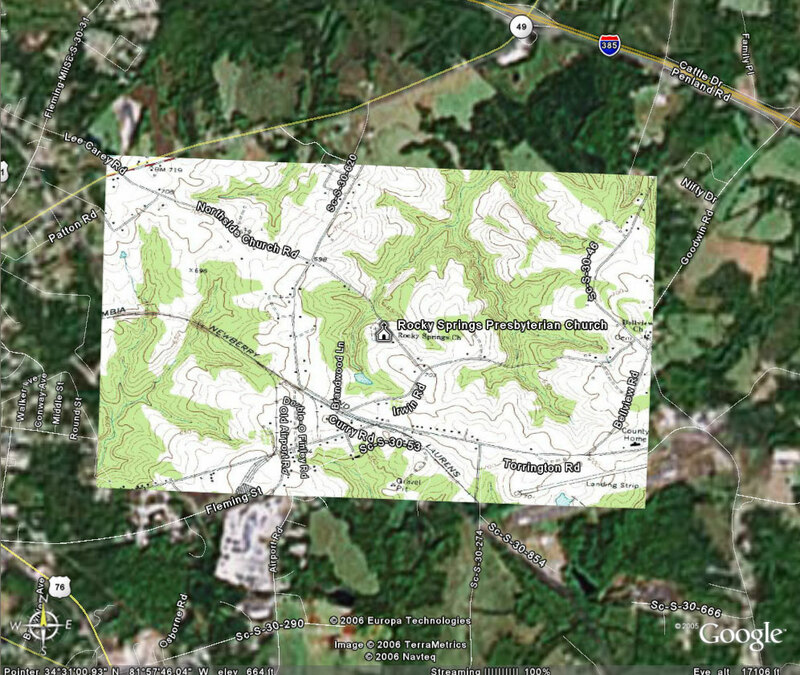 Next I found a topographic map online and created an image overlay with it. I did this because the Rocky Springs area is in low resolution, and I needed a clearer image of rivers and other natural features. Finally, I created an overlay with the land grant plat. I tried to match the stream on the plat with the one indicated on the topo map, and also with what I remember from the area. It’s not very accurate, but gives me a better understanding of where my great-great-great-great-great-grandfather’s land was.